'Artist Dia Batal's commission Cart-og-ra-phy: the unfolding of mobile narratives explores the lives of a group of women living in East London around Boundary Estate. 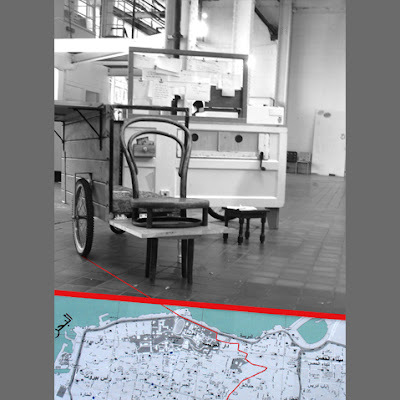 A mobile cart becomes a repository for the experiences of those often unable to cross social boundaries. The collaboration with St Hilda's Community Centre follows the journeys of women living a five-minute walk from Rivington Place and in one of Europe's most creative neighbourhoods. The object of the cart hosts the stories, photographs and memories of the women who have come to London from around the world, giving them an often neglected voice. Ideas and work from the artist's project will be on display in the Education Space Thursdays 12-9pm, Fridays & Saturdays 12-6pm from 2 June - 24 July 2010. Organised to complement the Whose Map is it? exhibition.